SD integrated reinforcing system: The SD integrated concrete reinforcing system represents Sidenor’s approach to addressing significant demand for high ductility steel that provides increased protection against earthquakes. The system consists of SD concrete reinforcing steel, SD stirrup reinforcing mesh, Sidefit special mesh, SD wire mesh, Sidefor and Sidefor Plus prefabricated stirrup cages, Inomix steel fibres and lattice girders. Merchant bars: Sidenor is the sole producer of merchant bars in Greece. Its portfolio of merchant bars consists of hot-rolled square bars, hot-rolled flat bars of rectangular cross-section, hot-rolled round bars of circular cross-section, hot-rolled equal angle bars with round edges, I-section beams (IPE), and UPN channels. Wire rod: Wire rod of S.A.E 1006, 1008, 1010 grades, RSt37-2 electrode quality, in cross sections from Ø 5.5 to Ø 16.0, which is suitable for a wide range of size reduction applications and meets all low-carbon wire production needs. Hot-rolled flat products: Steel plates. SBQ-Special steels: Hot-rolled round bars (diameter: 22-120mm) and peeled turned and polished round bars (diameter: 30-115mm) used in the automotive industry and in various industrial applications. Special profiles: THN mining profiles for use in the manufacturing of steel arches in public works (tunnels and road works), underground and other mines, offering high resistance and top support. Railway connections are hot-rolled special profiles used in the construction of S49-type railway tracks and constitute the connections between separate rails. Boron flats are widely used in the forklift industry for the construction of forklifts where high resistance, hardness and weldability are required. Ploughshare blades are special hot-rolled profiles which are manufactured according to customer specifications and are used in the construction of ploughs. 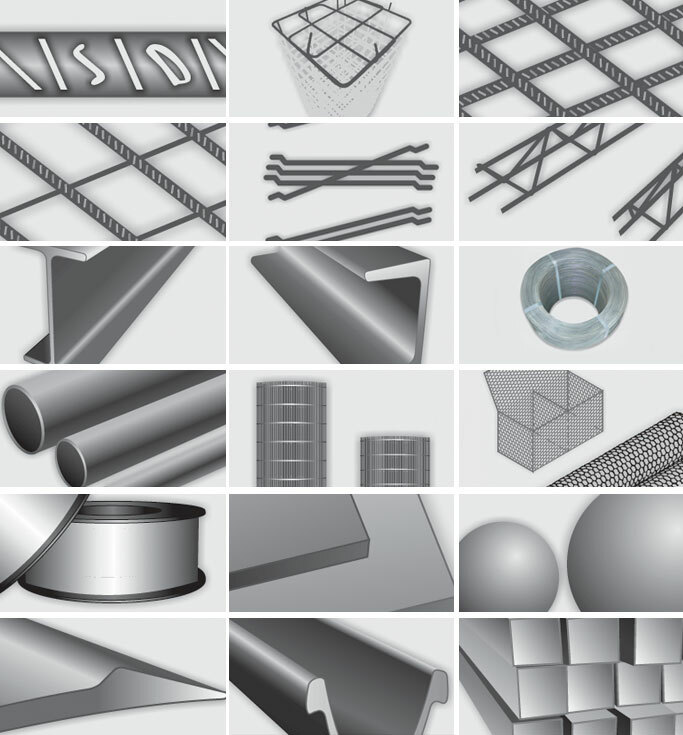 Other products: Double-twist hexagonal mesh (serasanetti), wire products (galvanized and black), welding products, steel balls and metallurgical by-products.